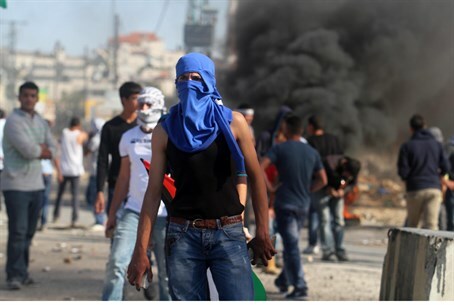 An Israeli driver was attacked by about 25 Arab rioters who were lying in wait to attack Jewish cars – just 300 meters from Hebrew University. Koby Goldstein was on his way to pick up his children in the Maale Zeitim neighborhood of Jerusalem the News1 site reported Thursday night, when over two dozen Arabs emerged as he turned a corner entering the Abu Tor neighborhood. Fortunately for Goldstein, he was driving an armored vehicle, which was able to withstand the onslaught of large stones and rocks the Arabs lobbed at the vehicle. Still they tried to damage the vehicle, using sticks and poles to try to break in the windows. Goldstein was able to drive away, with minimal damage to the vehicle. So far, no arrests have been made. Goldstein said that the experience, although severe, was not unique; rock throwing was very common in the area. Attacks in the area in general are not uncommon. On Wednesday, Arabs threw firebombs at homes of Israelis in the area. One purpose sustained light injuries in the attack. The terrorist who threw the bomb was arrested.